I had mixed feelings for this past weekend while Tony was out of town. On the one hand I was very excited to spend so much time with Owen, and on the other hand I was a little nervous for the lack of sleep and being the only adult. Either way it was going to happen, and I needed to make it work. Since daddy had a chance to get away maybe some time in the future mommy can have a girls’ weekend (honestly I probably can’t do a weekend, but maybe a night), possibly for my birthday :). At least for now I will have to settle for a girls’ night with Owen being the only man. Owen did well while we hung out and socialized a bit . We never watched a movie like we planned, but we had a good time catching up. Owen woke up twice on Thursday night to eat which made Friday a very long tiring day at work. I am thankful that a friend of ours was able to pick him on Friday afternoon from daycare – that was a big help! On Saturday the weather was pretty nice. We had a stroller date with a neighbor, and we were able to grab some coffee. We also hung out in the back yard a bit, and mommy enjoyed some wine and caught up with a friend. Today we had a visit from my grandparents, and had brunch at Cap City. All-in-all it was a good weekend, but I feel like I need to sleep for 3 days straight to recuperate. New moms out there, I have been curious about a few things. One being when will my hair stop falling out? It seems that every time I brush my hair or run my hands through it a good amount comes out. I am glad I have a lot of hair, but I think it is getting a lot thinner. It is starting to freak me out a bit. Also when did you start fitting into your jeans again (if ever)? I have been working out, but I still can’t seem to fit back into my jeans. I know its only been a few months, but i am getting antsy and having more choices on what to wear in the morning would be a plus. Any input good or bad would be great, thanks! 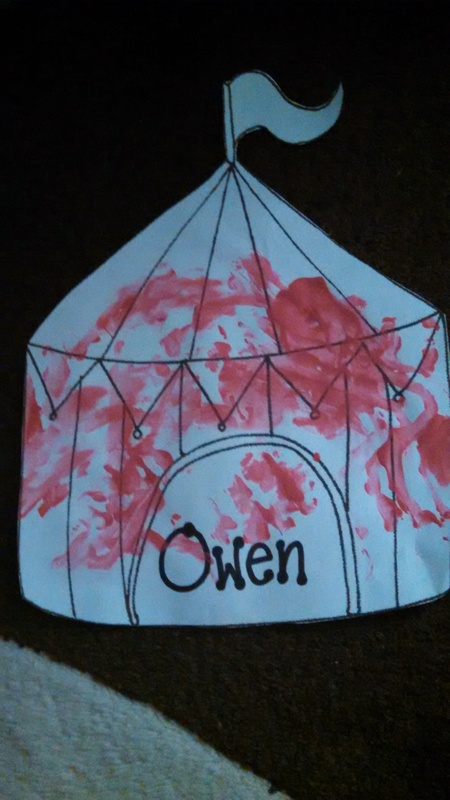 Oh and here is a picture of Owen’s first masterpiece. So it’s been a while since I have posted here. It turns out that any “free” time I used to have pretty much doesn’t exist anymore. I’m lucky if I get a half hour before bed to read. Don’t get me wrong, I love spending time with Owen (especially after being at work all day), but having me time is something I think everyone needs. This past weekend we traveled to Pittsburgh for a family reunion and a Christmas in July… in August party. The reunion was a short drive out of Pittsburgh to Somerset, Pa. It was nice for some of the more distant family members to meet Owen for the first time. 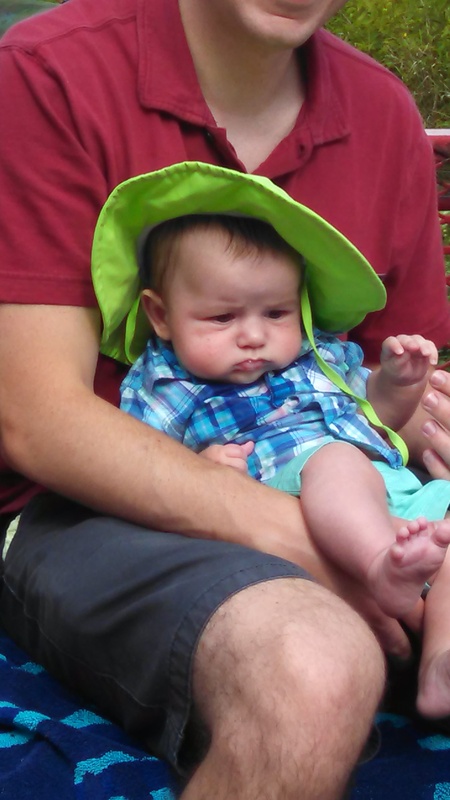 Owen went on his first hayride, and he had his first (very short) dip in the pool. I think he enjoyed the hayride because he was moving and had a good view. The pool was another story. The water was quite a bit colder than he’s used to with his baths. At least he looked cute in his new bathing suit :). 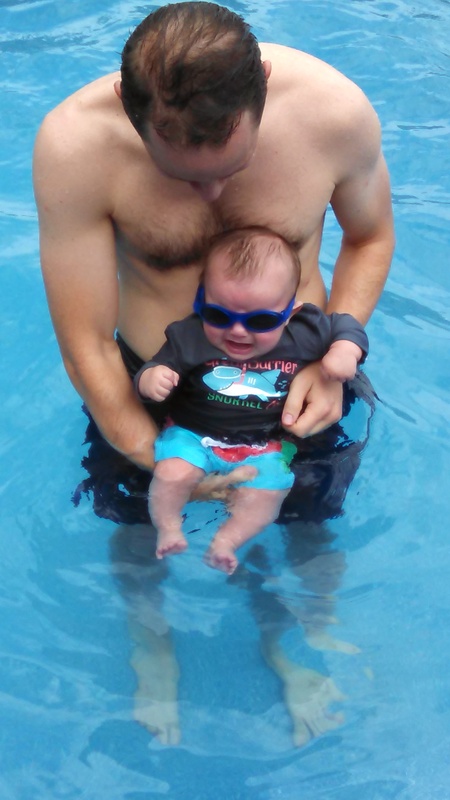 I am hoping that when we go on vacation the water will be warmer and he will enjoy it more. Owen seems to be adapting well to daycare. This past week I got a call from them while I was at at work (talk about freaking out) saying that he has been having some trouble finishing his bottles. This was a surprise to me since at home he finishes bottles very well. The same day they called I noticed him feeling a little uncomfortable during feedings so we decided to go back to the sensitive formula, which is what we started with. Hopefully in a few days he will start feeling 100% again. 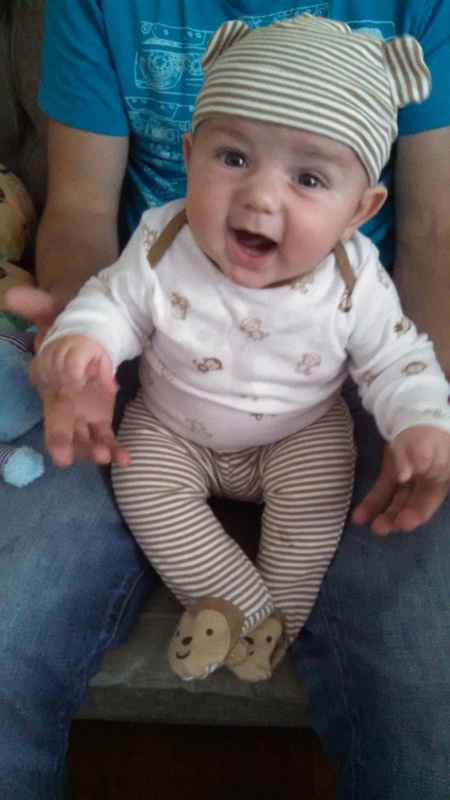 Thank you cousin Sheena for my monkey PJ’s!